Pet Policy: Dogs up to 50lbs. 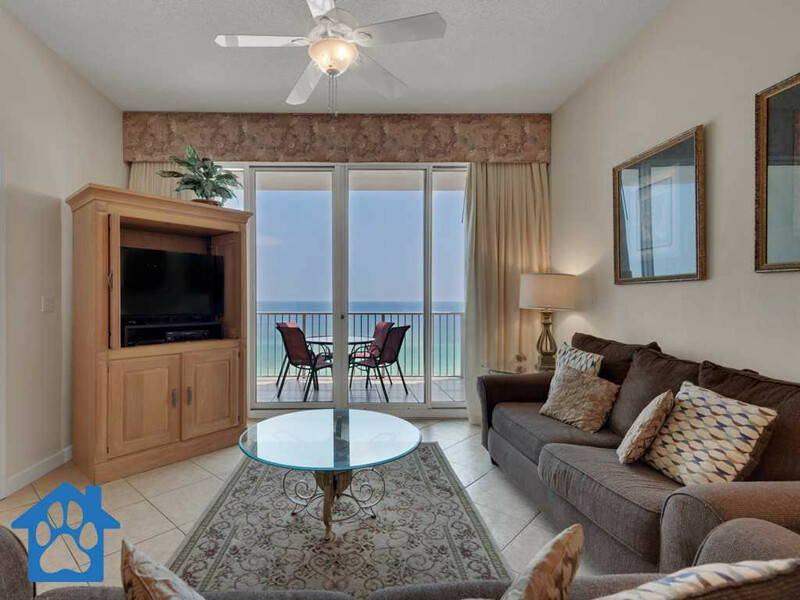 Description: Beautifully appointed waterfront studio-condo located in the peaceful Pirates Bay resort in Fort Walton Beach. 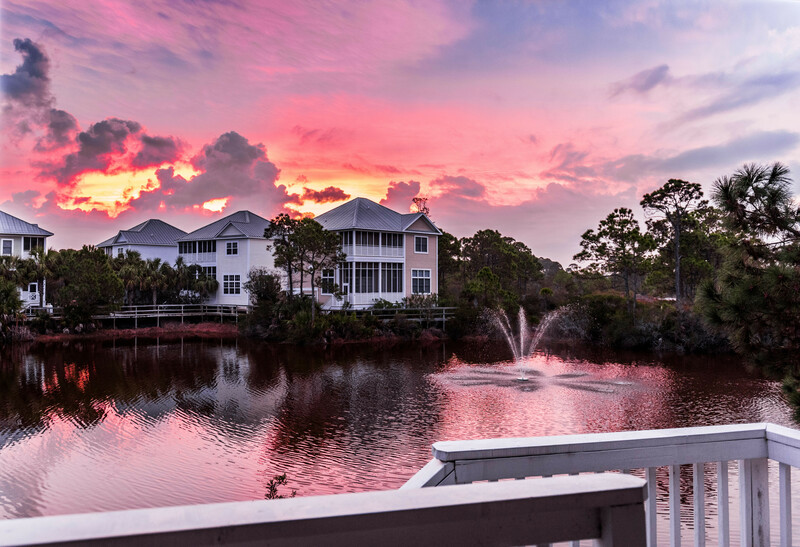 The resort enjoys a fabulous location, backing onto the Santa Rosa Sound and just 2 minutes away from the beautiful emerald coast white sand beaches of Okaloosa Island. Pet Policy: Small dogs up to 30 pounds. No pet fee. Description: 2nd Floor - King Bed, Hallway Bunks, Sofa Sleeper Enjoy a FULL OCEAN VIEW from this convenient 2ND FLOOR location. BEACH SETUPS INCLUDED...This condo is located above the pool in the beachfront building at Maravilla. Only a few steps to the elevator and stairs. KING BED, 2 HALLWAY BUNKS, sleeper sofa. All-tile floors. Washer/dryer in unit. PET FRIENDLY for Small Dogs. Wireless internet. Call or book online today! Pet Policy: We require all pets to be listed on the rental agreement at the time of signing. Prior to your arrival we require a note from your vet verifying that your pet is current with all of their vaccines, licenses, prescription heartworm, flea, and tick medications. In addition, all guests are personally responsible for cleaning-up after their pets (whether on our property, or during a walk around the neighborhood). 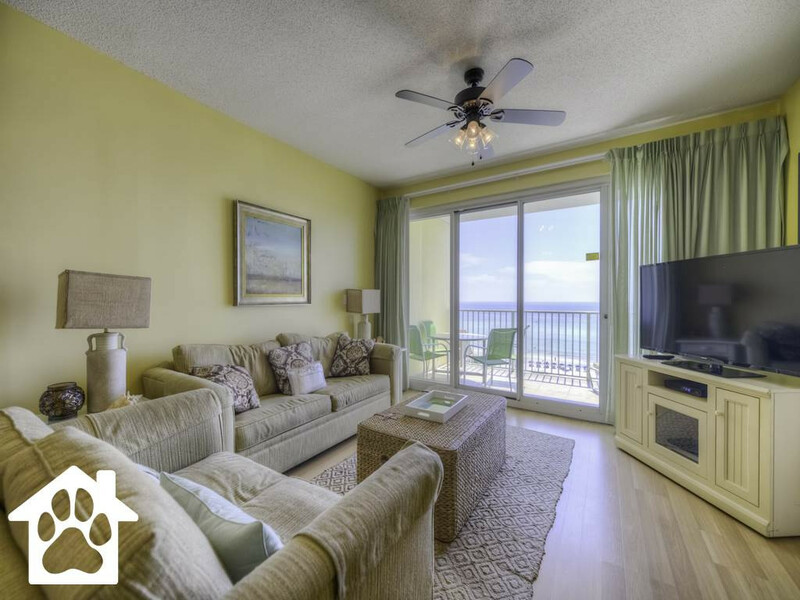 Description: SunRise Villa Indoor Living Space Our Indian Rocks Beach SunRise Villa sleeps 2 comfortably. Fully equipped kitchen w/marble counter tops and breakfast bar (seats 2), dinette area (seats 2), linen/laundry closet with full-size stackable washer & dryer, Full bathroom with tub/shower, living room with queen sleeper sofa and large comfy chair with ottoman, bedroom with queen size bed and large closet, ceiling fans, windows in every room, and light laminate wood-look floors throughout. Patio doors off the dining area open to the private, covered deck w/ ceiling fan, BBQ grill, table & chairs. SunRise Villa Outdoor Living Space Private, covered deck with ceiling fan and locking gate, outdoor lighting, gas BBQ grill, area rug, and table & chairs. This home also has off-street covered parking and a covered entryway. The deck stairs lead to the common courtyard with fire-pit. Pet Policy: We require all pets to be listed on the rental agreement at the time of signing. Prior to your arrival at the home we require a note from your vet verifying that your pet is current with all of their vaccines, licenses, prescription heartworm, flea, and tick medications. In addition, all guests are personally responsible for cleaning-up after their pets (whether on our property, or during a walk around the neighborhood). 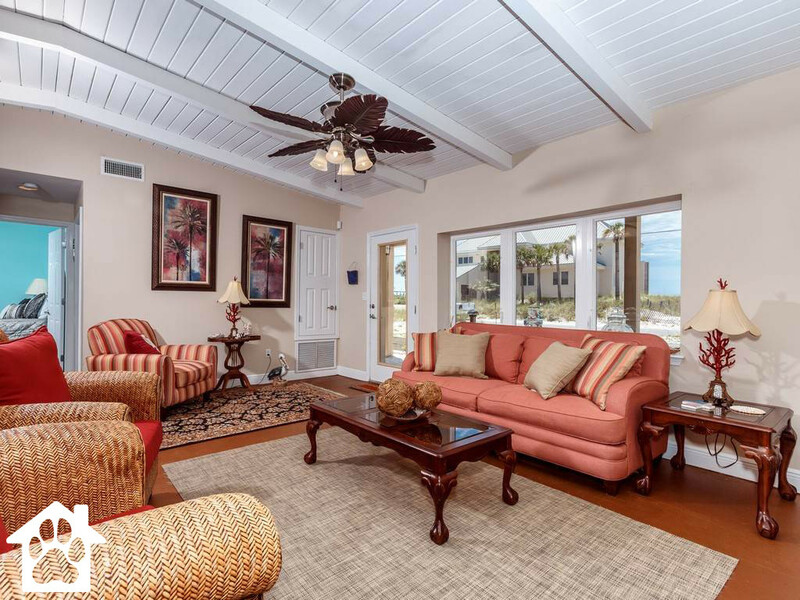 Description: Palm Cottage is a 2b/1b home located in Indian Rocks Beach, FL. 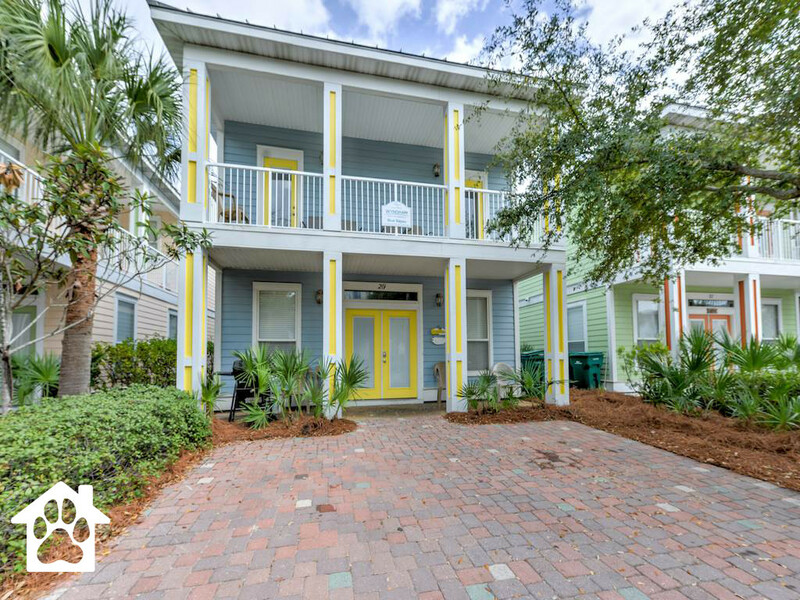 This home sleeps 4 comfortably and is newly updated, open & airy, super clean, and is centrally located withing the city of in Indian Rocks Beach. 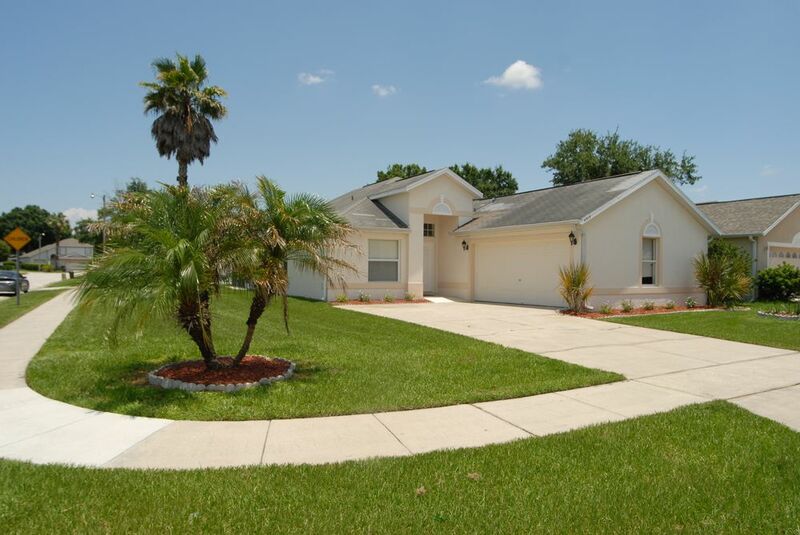 A peaceful neighborhood setting, great for families with children! 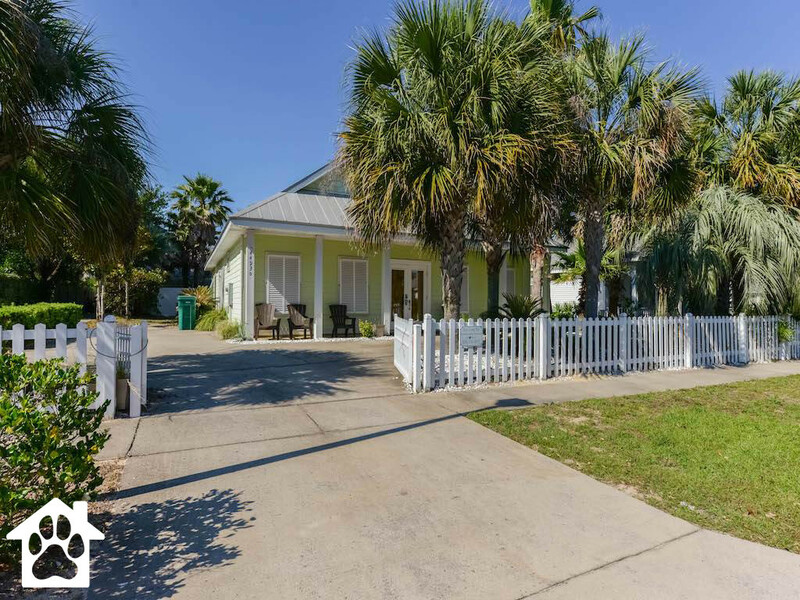 No traffic noise or congestion, yet only a 3 minute stroll to parks & playgrounds, and a five minute stroll to the beautiful Gulf of Mexico beach access, pubs, shops, dining, and beach trolley stop. This is ground-level home with convenient access to the living space (one step up). This is a pet-friendly home. Smoking is not permitted inside this home. 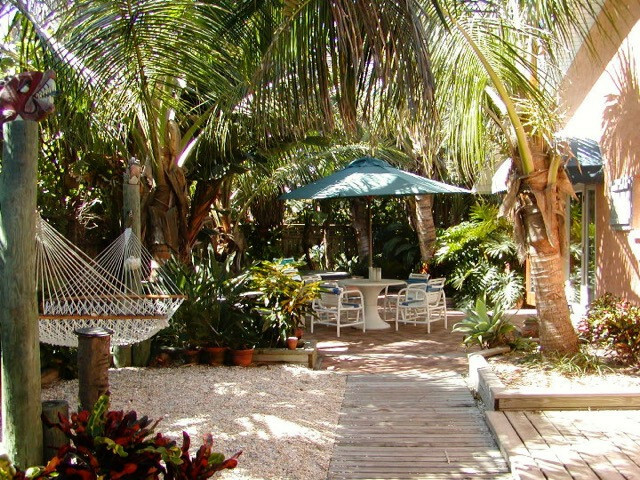 If you are looking for a laid-back, quiet getaway, then Palm Cottage is the place for you. If you are looking for a wild & crazy party atmosphere, you won't find it here! 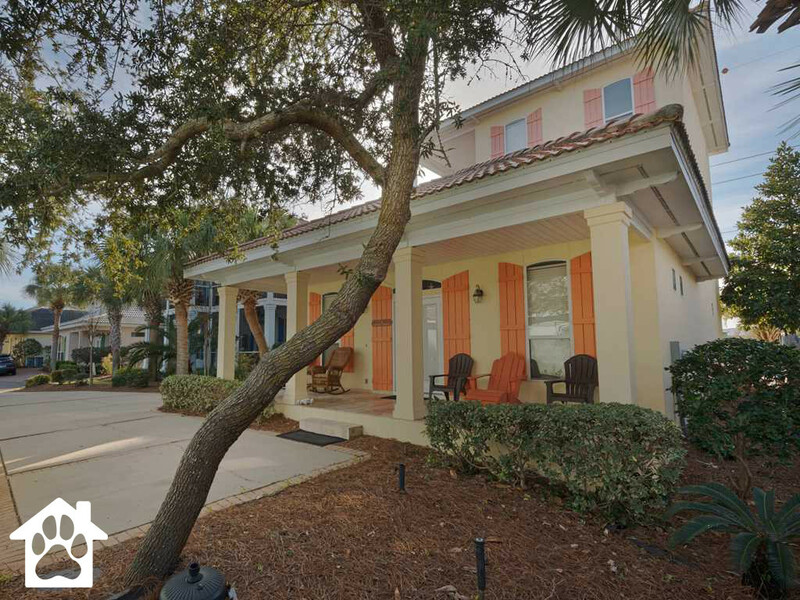 Description: Our Indian Rocks Beach SunSet Villa is a great 2b/2b vacation rental! 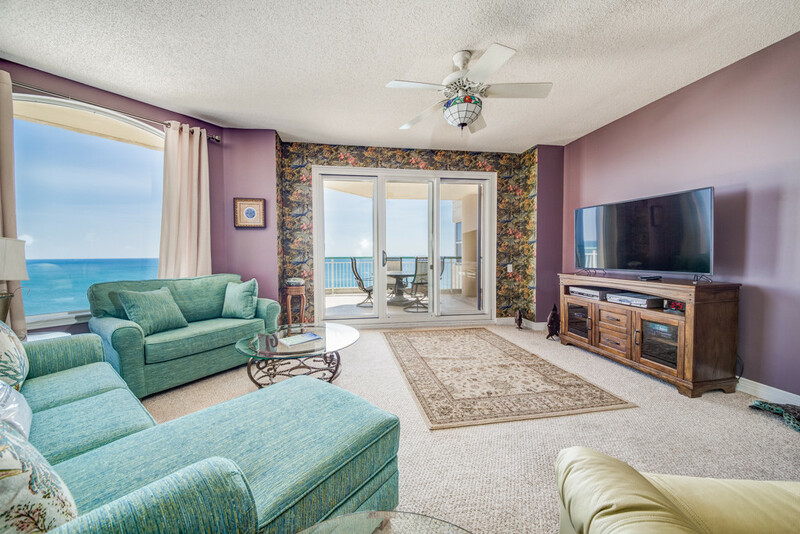 It is completely updated, light, bright, clean and has one of the best central locations in Indian Rocks Beach. A quiet, friendly neighborhood setting away from the Gulf Blvd. traffic and congestion, yet only a 3 to 4 minute stroll to the public beach access. This is an elevated stilt home with 15 steps to access the living space. This is a pet friendly home. Smoking is not permitted inside this home. If you are looking for a laid-back, quiet getaway, then SunSet Villa is the place for you. If you are looking for a wild & crazy party atmosphere, you won't find it here! Pet Policy: We require all pets to be listed on the rental agreement at the time of signing. Two weeks prior to your stay we require a note from your vet verifying that your pet is current with all of their vaccines, licenses, prescription heartworm, flea, and tick medications. In addition, all guests are personally responsible for cleaning-up after their pets (whether on our property, or during a walk around the neighborhood). 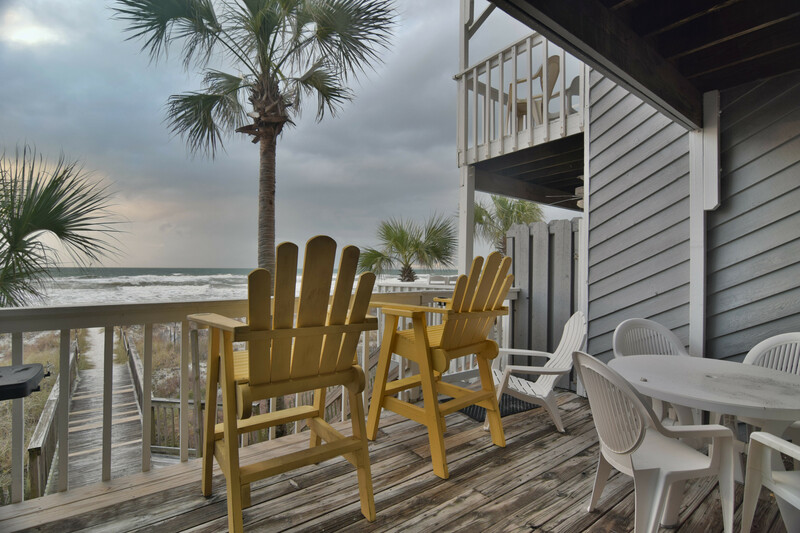 Description: Cozy Cottage is an adorable 1bed/1bath vacation rental. 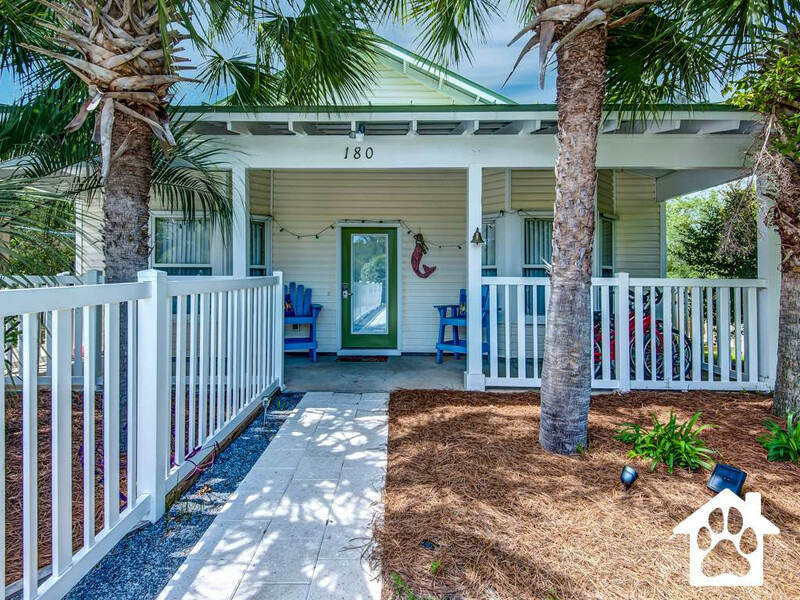 This beach cottage is updated, light, bright, clean and has one of the best locations in Indian Rocks. 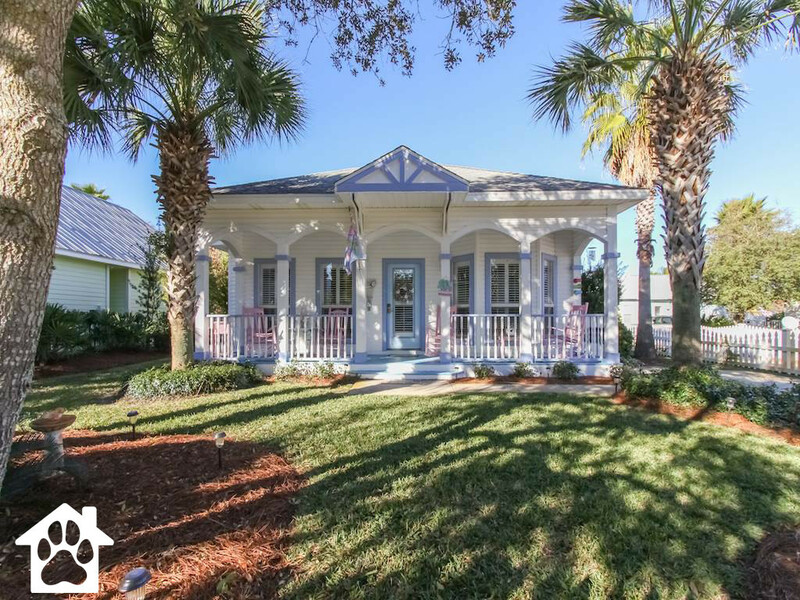 A peaceful neighborhood setting away from traffic and congestion, yet only a 3 minute stroll to the Gulf beach public access (about 350 yards or 1050 feet). Cozy Cottage has off-street parking and room to park a boat and/or personal watercraft w/trailer. Cozy Cottage is an elevated home with 15 steps to access the living space. This is a pet-friendly home. Smoking is not permitted inside this home (outdoor patio only). If you are looking for a laid-back, quiet getaway, then Cozy Cottage is the place for you. If you are looking for a wild & crazy party atmosphere, you won't find it here! Cozy Cottage-Indoor Living Space:Cozy Cottage has an open floor-plan with a total of 578 sq. ft. indoor living space that sleeps 3 comfortably; full-size kitchen, dining area which seats four, linen/laundry closet, bathroom with tub/shower, living room with full-size futon couch/sleeper, bedroom with queen size bed and two closets (with extra storage above closets), ceiling fans throughout, windows in every room, and laminate wood-look floors throughout, with area rugs in the dining and living room areas (these may be removed if you are staying with your pet). Description: The Beach Bungalow is an oceanfront compound of three two bedroom villas, all with individual fully fenced private tropicals gardens with in ground spas. The villas are appointed with French terra-cotta and marble tile ground floors and hardwood on the second floor. 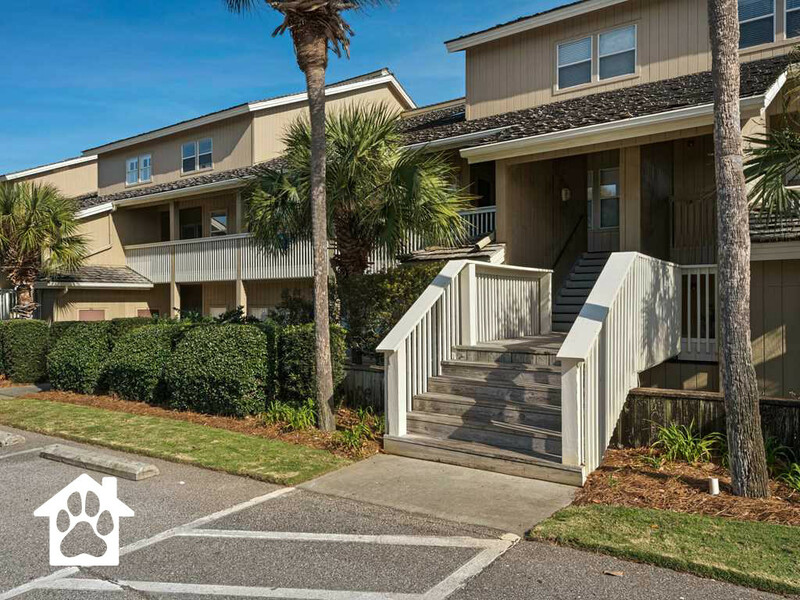 The location is ideal, with all the amenities of our little beach town only blocks away and the beach at the front door. Please check our website for lots of photos and descriptions and to book a villa. See you at the beach! Pet Policy: Welcoming 1 dog with a fee of 125.00 for the stay, maximum weight of 30 pounds. Pet Policy: Dogs welcome to enjoy the beach with you. Description: Welcome to Blue Lagoon! This complex has one of the best community pools on the island! Large, tropical pool with a 10' waterfall right outside your back door! Each property has its own distinct personality, but one thing youâ€™ll be able to find is an eye of casual island luxury. Blue Lagoon 5 makes room for up to six guests to sleep comfortably throughout two bedrooms and bathrooms. 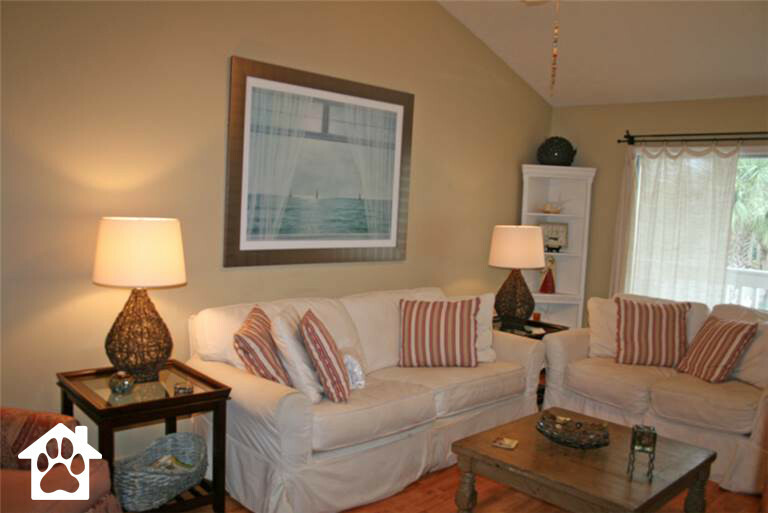 (2) Bedrooms, (2) Bathrooms, accommodates up to (6) people: 1 King, 2 Twins, 1 Sleeper Sofa. The master features a king sized mattress and in the guest room is a set of charming twins. Another couple of people can get cozy on the sleeper sofa in the living room. 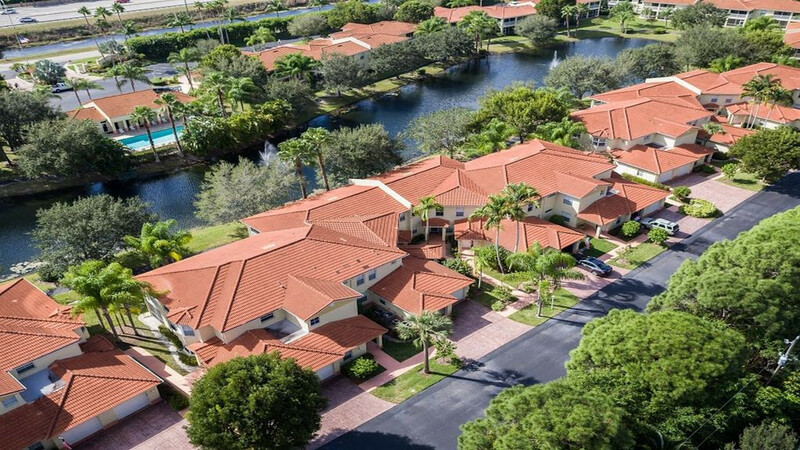 Your vacation condo will sit right next to a charming community pool. 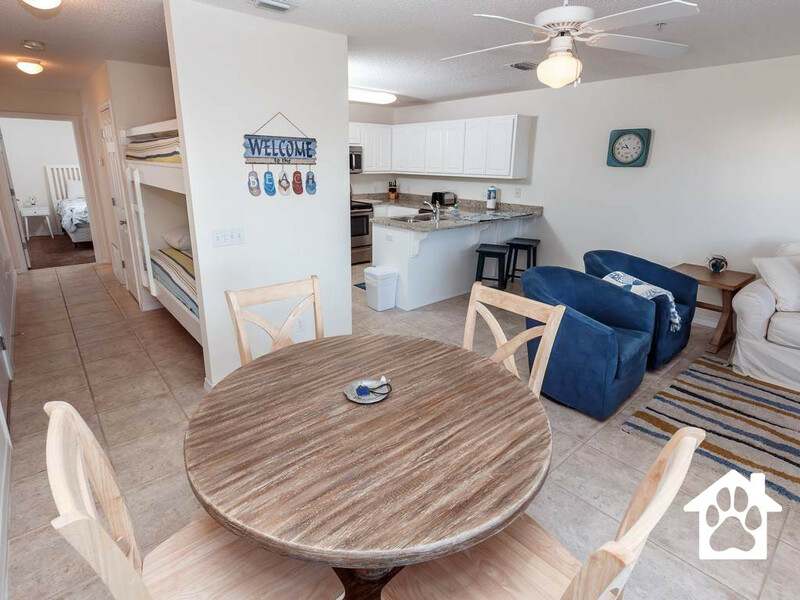 Heated to a comfortable temperature in the winter, but featuring a wading and sunbathing area that is perfect for our sundrenched Florida summers. In cooler months, turn off the air conditioning and open your windows to enjoy the trickling sound of a ten inch waterfall. Other features poolside include a shared barbeque grill, lounge chairs, and shady tiki hut. 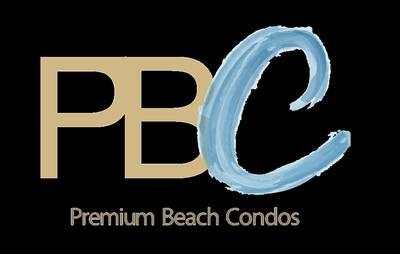 And if you prefer to keep it a little more natural for your swim, the Blue Lagoon Condominiums are less than two blocks from the Gulf of Mexico with our world famous and pristine white sand beaches. Slip on your flip flops and take a quick jaunt down to the water where you can enjoy all sorts of fun in the sun. Local favorite past times include paddle boarding, kayaking, snorkeling, and for the boldest of hearts â€“ parasailing! Enjoy it all and if you need help making arrangements for rentals, just get in touch with us at the office. 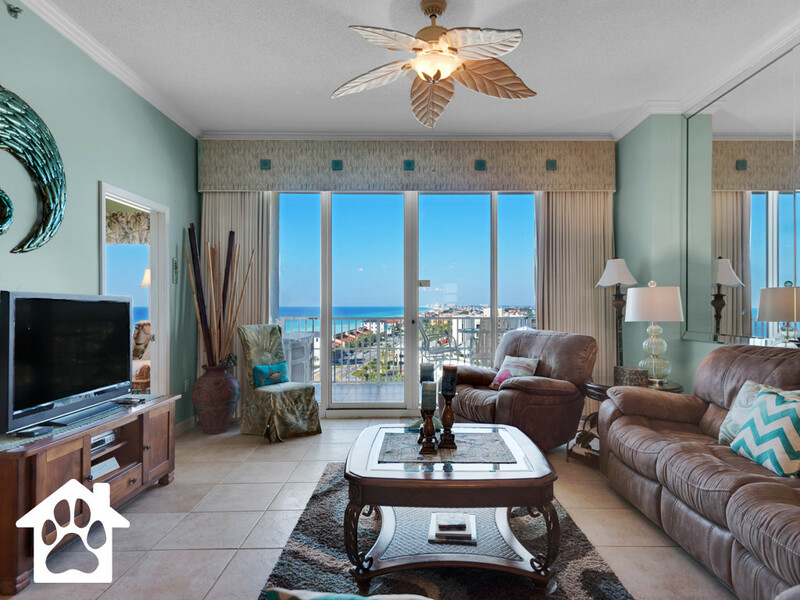 Island Real Estate can help get you set up with any one of our fabulous vendors in the areas. On your way back, hop a ride on the free and air conditioned Island Trolley that runs from 6am to 10pm every day. It will take you all throughout Anna Maria City, Holmes and Bradenton Beaches. So if you donâ€™t feel like cooking after a day of sandcastles and boogie boards, you can grab some takeout from anywhere around our little barrier island. Maybe a fresh and crisp caprese salad from Village CafÃ© over on Pine Ave. Or if your vacation was meant for decadence, head down to Lobstahâ€™s in Holmes Beach where you can enjoy an extensive appetizers menu, indulgent local cuisine and even an Island Real Estate cocktail! 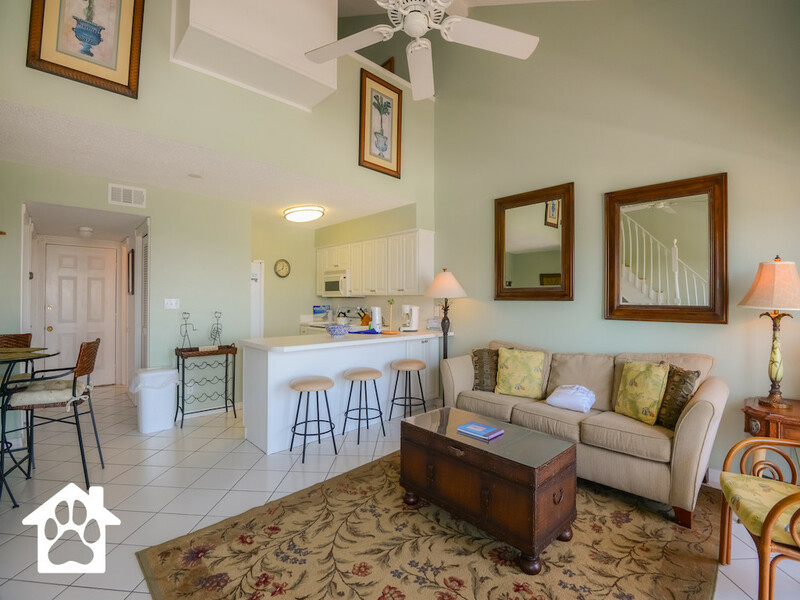 However you spend the vacation daze, Blue Lagoon 5 will be a comfortable corner of paradise for you to come back to. 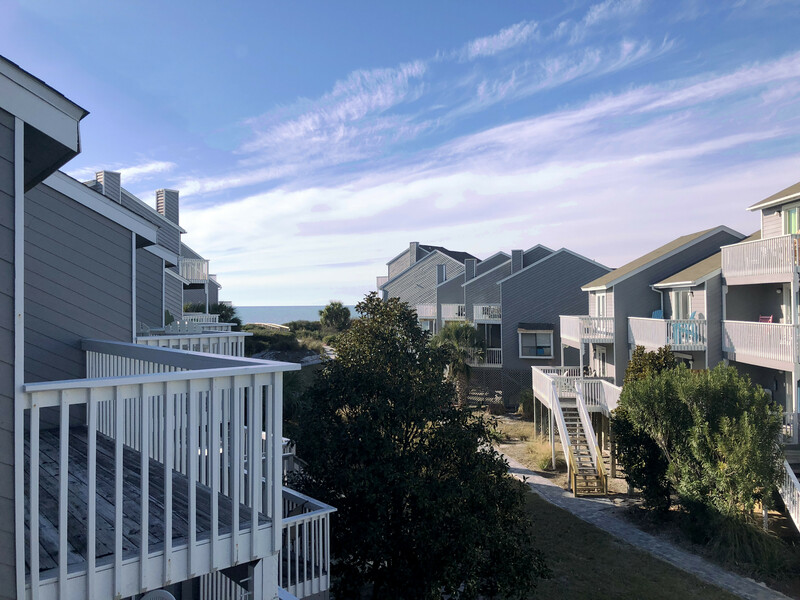 As a member of our Premium Linens Program, the vacation condo will provide hotel quality sheets, beach and bath towels for everyone in your party. Youâ€™ll be swimming, sleeping, and showering with an extra shot of luxury that will make you forget all about hotel living. 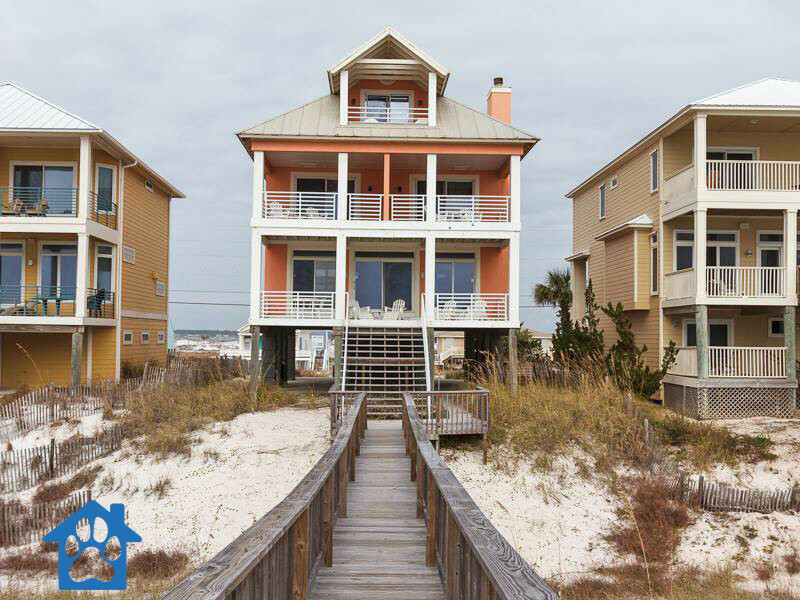 Book with Island Real Estate today and that will put you one step closer to a dream vacation in Holmes Beach. We canâ€™t to see you around Blue Lagoon! Great news, this property welcomes ANY DAY arrivals in â€œnon-peakâ€ seasons. However, over most US holidays and during January-Easter the calendar is strictly SAT-SAT. Pet Policy: Dog-Friendly, Pet Fee: $125 Non-Refundable. 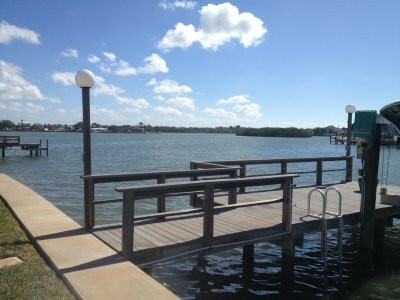 Description: The Zen Water House is a 3b/2b/Intracoastal Waterway home located in Indian Rocks Beach. 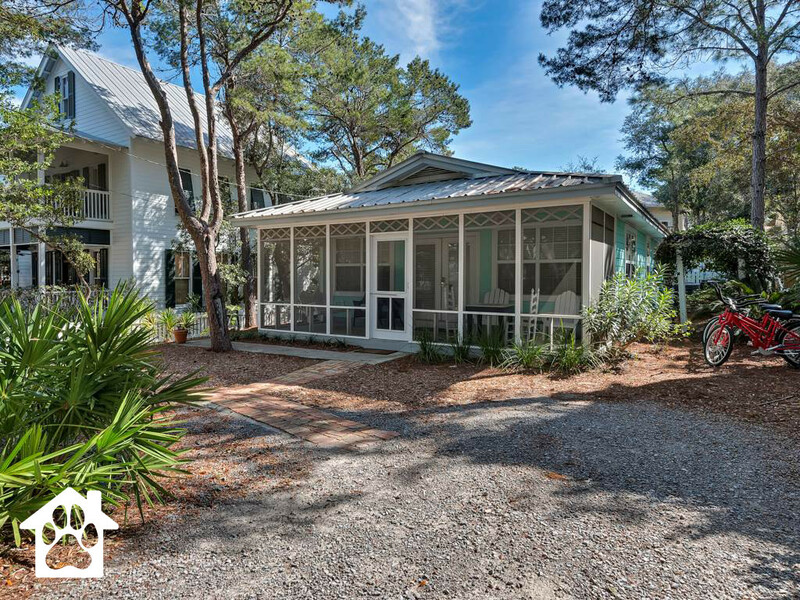 This comfy beach house is completely updated, modern & clean, and has beautiful views of the intracoastal waterway. The dock is a great place to relax and enjoy your morning coffee and soak-up some tranquility or indulge in some Yoga or meditation. Launch the kayak off of the private dock and spend some time on the water enjoying the dolphins, manatees and the many seabirds that call the intracoastal their home (don't worry, no alligators here!). 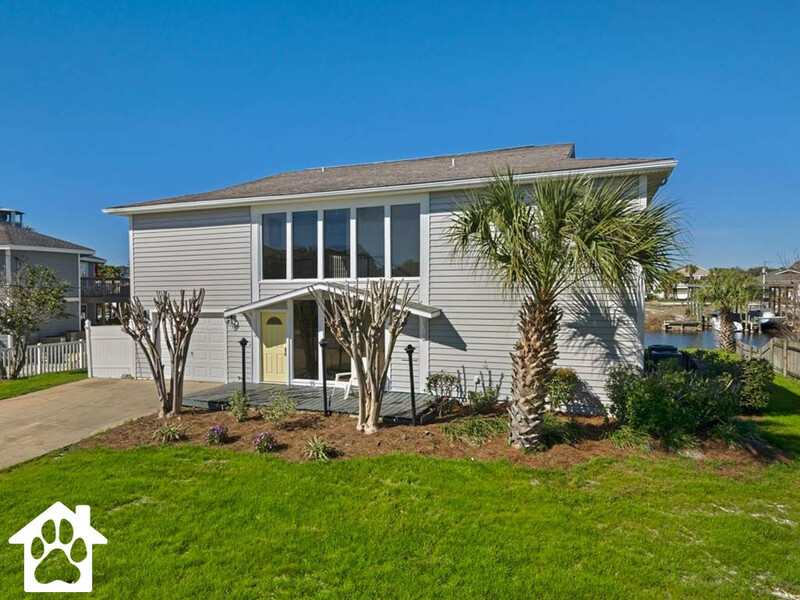 Great central location; this home is within walking distance to the beach (about 528 yards or 1584 feet/6 minute stroll), great IRB restaurants, pubs, parks, & more! This is a ranch style home (ground-level) with convenient access to the living space. This is a small-pet-friendly home. Smoking is not permitted inside this home. If you are looking for a laid-back, quiet getaway, then Zen Water House is the place for you. If you are looking for a wild & crazy party atmosphere, you won't find it here! 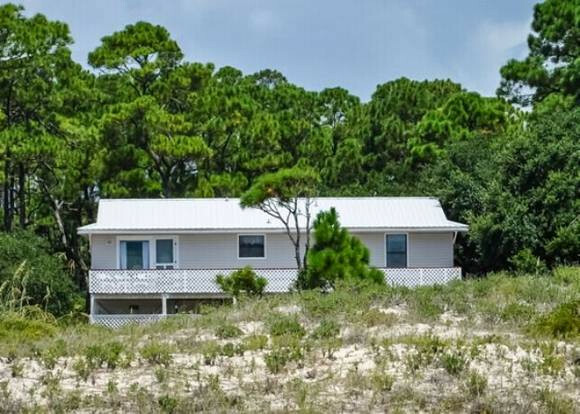 This home is best suited for retirees/winter snowbirds, corporate housing/relocation, and family vacation getaways (this is NOT a party house!!!). 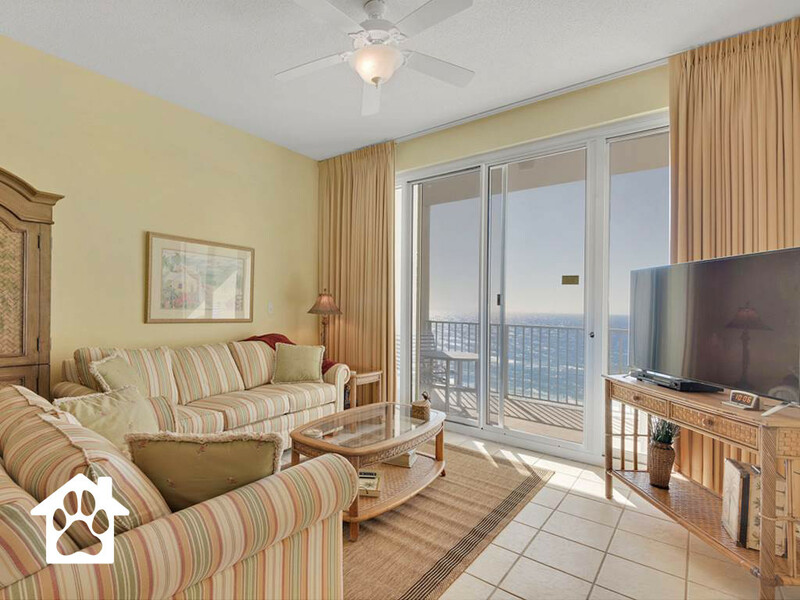 Description: Enjoy this modern condo, located in Inlet Beach, Florida. 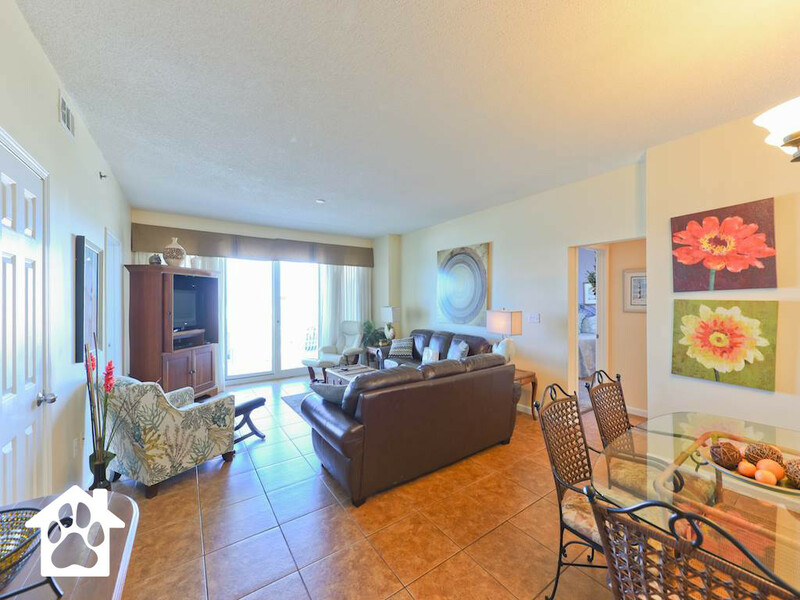 This two bedroom location is pet friendly and has a beautiful master bedroom. 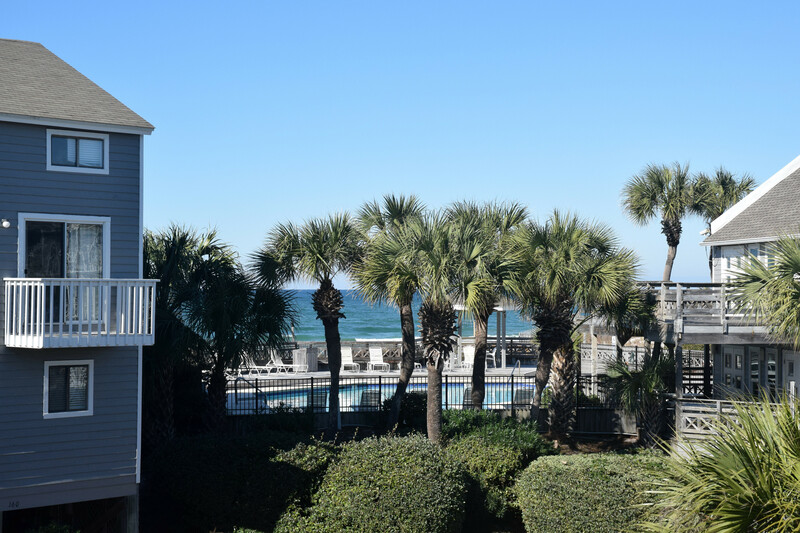 Your room will have a view of the relaxing pool, and you are only a short bike ride from the beach. This condo can sleep up to six and has two baths. 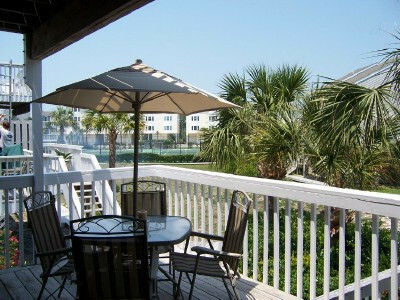 Come sit in the hot tub and enjoy all Inlet Beach has to offer. 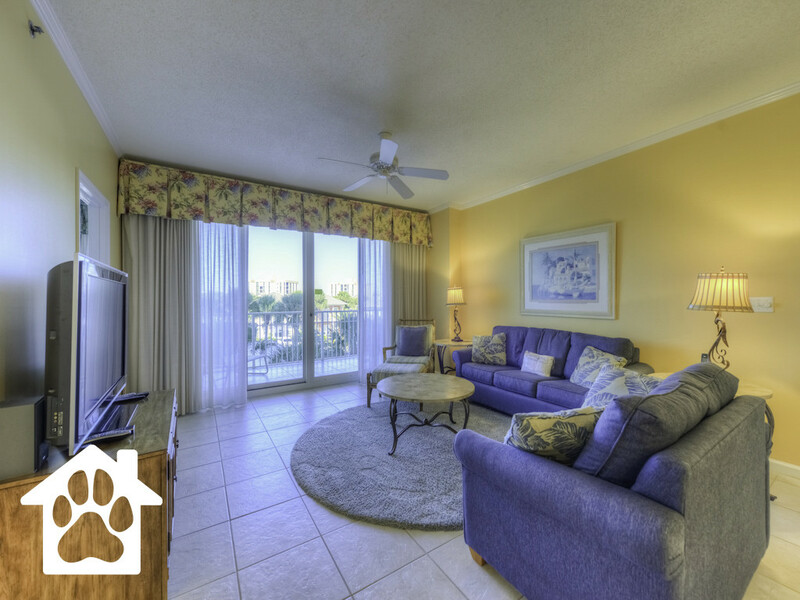 Pet Policy: Dog friendly rental and beach. Description: Come and enjoy your stay at this two bedroom condominium. 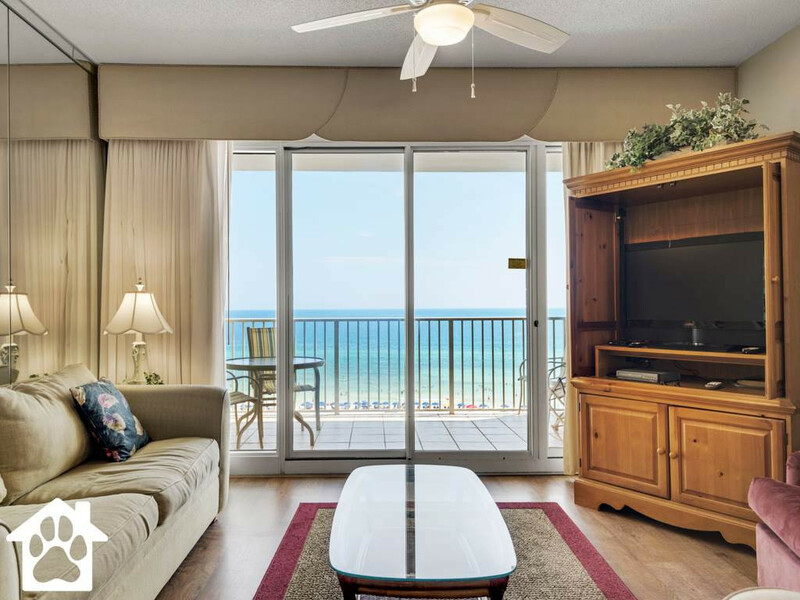 Located in Pensacola Beach, Florida, you can enjoy the beach and all Pensacola Beach has to offer. 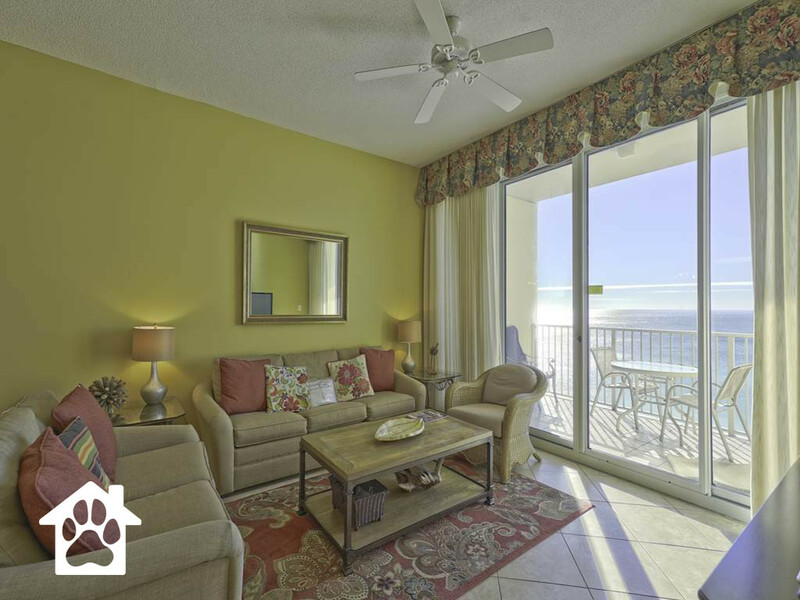 This unit will give you a direct view of the Gulf. Bring your whole family because this condo can sleep up to six people. Enjoy the pool and the large sundeck. Pet Policy: A $100 pet fee is required per dog, limit 2. Dogs are not allowed on the furniture or beds. Please clean up any dog “poo” in the yard. Dogs must be on a leash when walked. Crates — if you normally crate your dog at home, we ask that you crate him/her here as well. Flea and tick protection: fleas are here on the Gulf Coast in full force, so please be sure your dogs are current on their flea protection medicine. 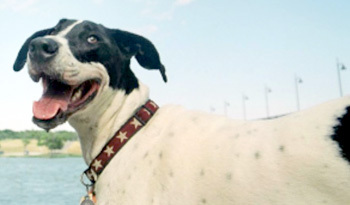 Dogs are not allowed on the beach at Gulf Shores and Orange Beach, but are allowed along the peninsula at Ft Morgan. Dogs are allowed on the beach on St George. Description: Sea Dream on beautiful St George Island! 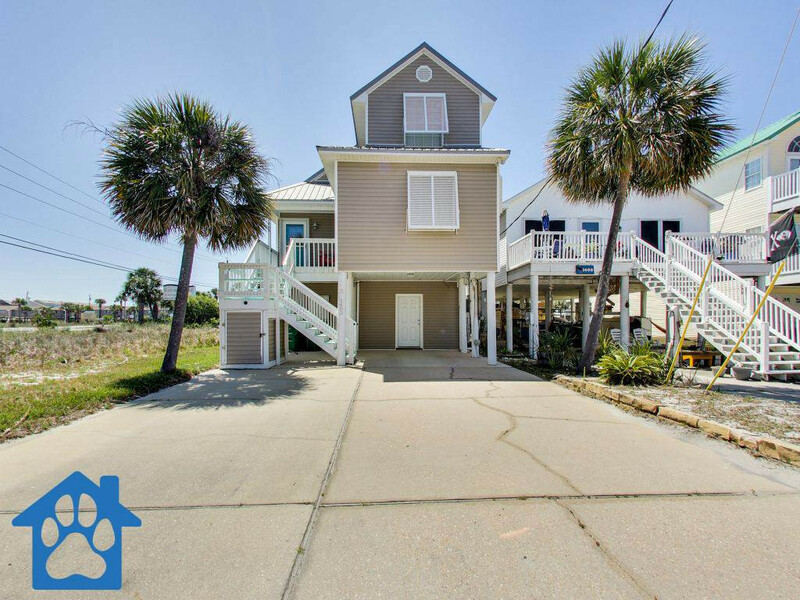 This single family beach view home is just a short walk to the beach and only 1 block from the bay. 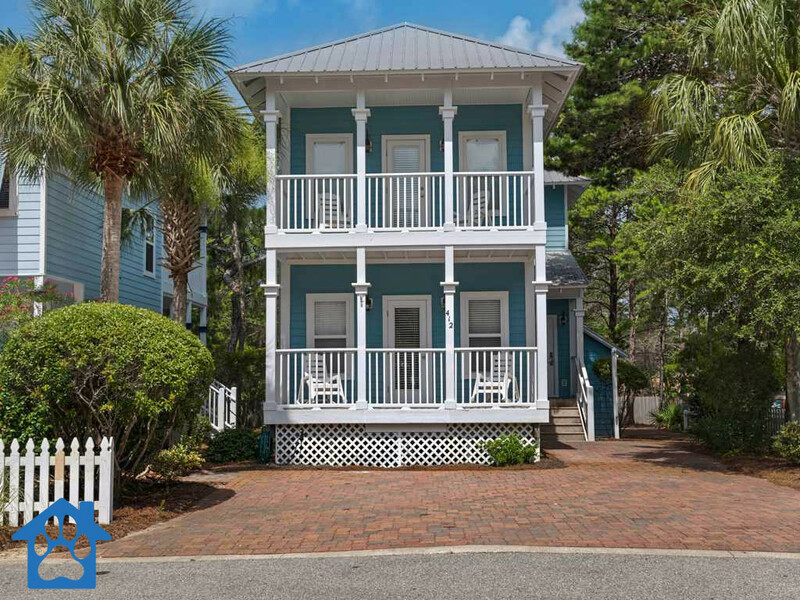 Sea Dream is built for comfort and you'll love the homey touches throughout this home. The open living area has room for the whole gang, and the kitchen is equipped to prepare simple meals Step outside the back door and relax on a large deck that runs the entire length of the home. There’s an outdoor shower, a fish cleaning station, picnic table and access to the washer and dryer outside. Other amenities include cable TV and wireless internet. 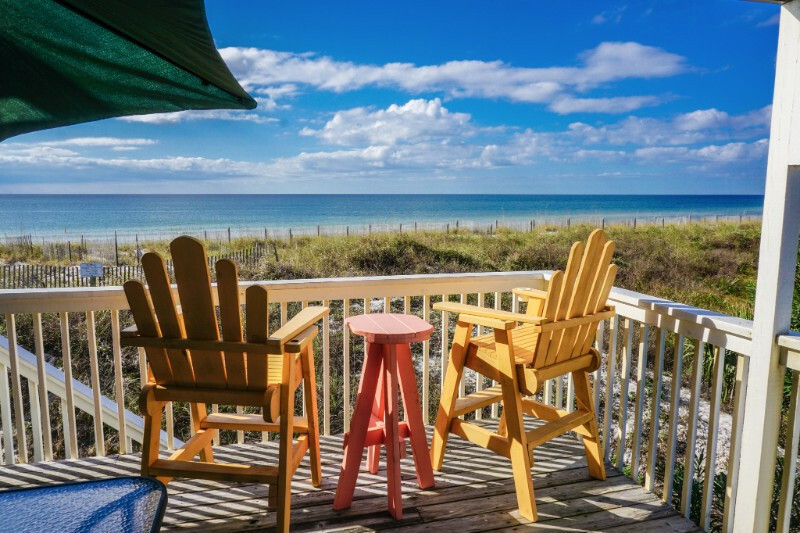 If you're looking for a relaxing, rejuvenating time away from home, then you'll love St George Island. It is a photographer and nature lover's dream. Pet Policy: Dog-Friendly, Max Weight of Pet, Pet Crate Required, Pet Deposit Required, Pet Fee: $125 Non-Refundable. 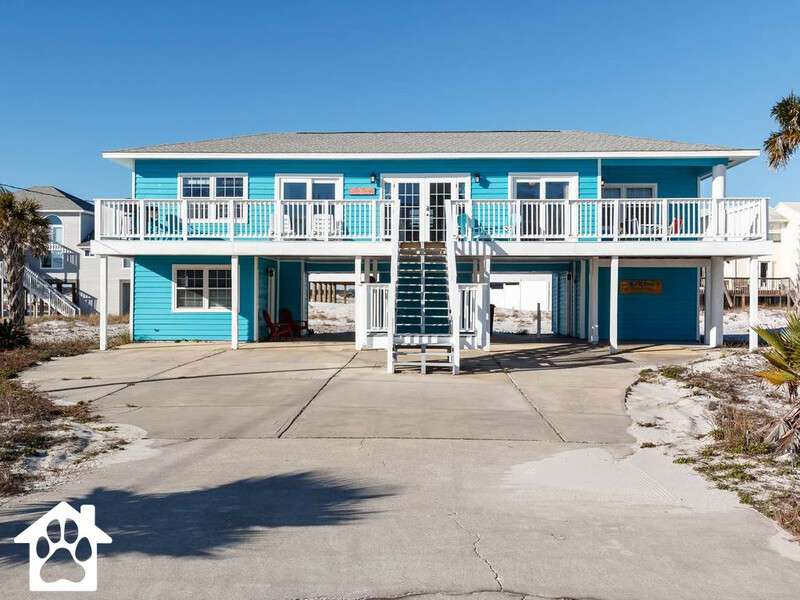 Direct Gulf Front – 3 beach front decks! Pet Policy: Dog-Friendly, Max Weight of Pet, Pet Deposit Required, Pet Fee: $125 Non-Refundable. 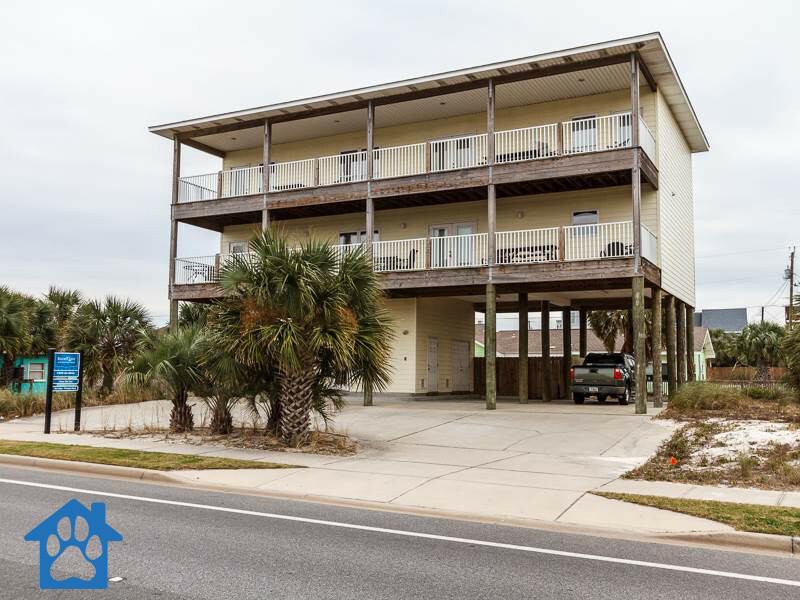 Description: Direct Beach Front – 3 beach front decks! | 3 Bedrooms & 3.5 Baths 1 King, 2 Queen Bedrooms, Queen Sleeper | Sleeps up to 8 Wireless Internet | 4 cable TV’s (43in HD in living room), 3 DVD’s Full kitchen & Laundry Area | Covered Parking Outdoor Shower & Hose | Gas Grill Approximately 1800 sq ft | Pet Friendly Central Heat and Air | All linens provided Gate on back porch for your dogs! 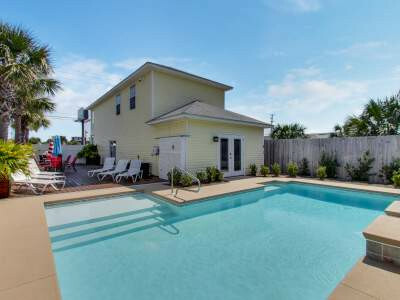 Description: Private Paradise Pool Home is a 3b/2b home located in Indian Rocks Beach. 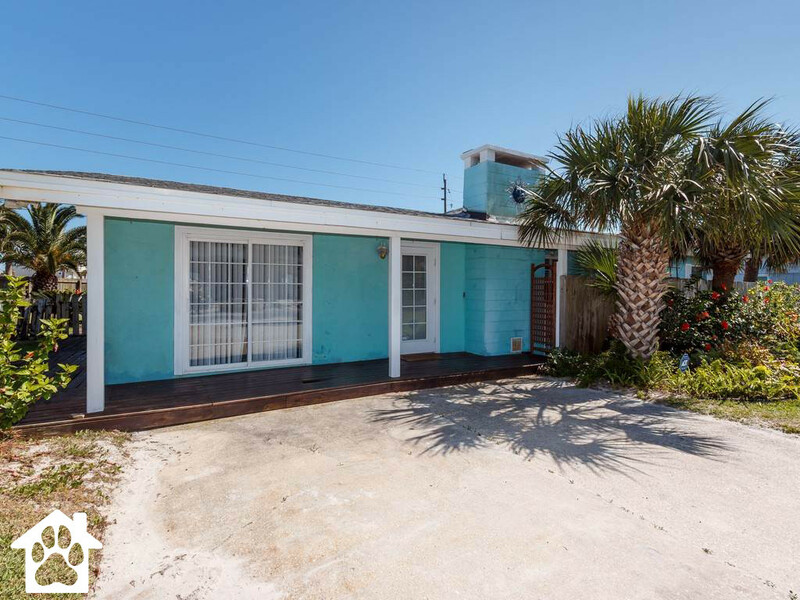 This home is completely updated, light, bright, clean, and has a great central location in Indian Rocks Beach. A peaceful neighborhood setting away from traffic and congestion, yet only a five minute stroll to the public beach access. 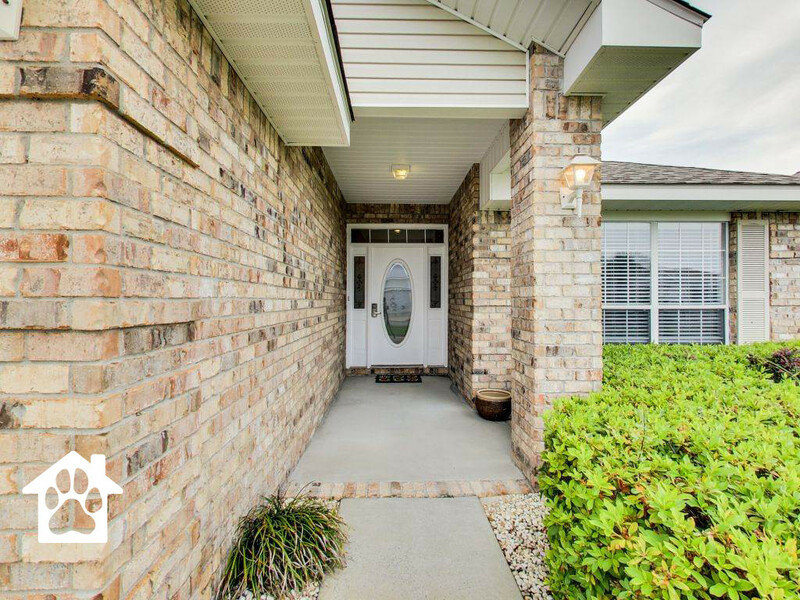 This is ranch style home with convenient access to the living space. This is a pet-friendly home. Smoking is not permitted inside this home. If you are looking for a laid-back, quiet getaway, then Private Paradise is the place for you. If you are looking for a wild & crazy "party like a rock star" atmosphere, you won't find it here! Indoor Living Space Private Paradise - Pool Home offers a split bedroom plan and sleeps 6 comfortably - 1 bedroom with queen bed (blue), 1 bedroom with full bed (yellow), and one bedroom with two twin beds (brown). Bedrooms have dressers and nice sized closets. The master bedroom has french-doors that open to the pool area. One full bathroom with tub and second bath with large shower. 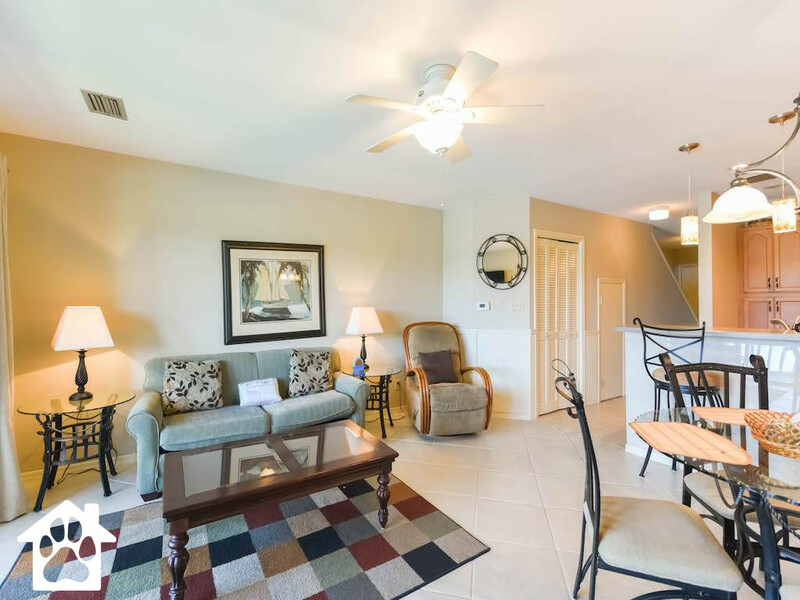 Fully equipped kitchen with granite countertops, generous-updated cabinet space, full-size newer appliances, ceramic tile floors, and patio doors that open to the poolside dining area from the kitchen. The main living space includes a dining area, living room with sofa, love seat and lounge chairs. Laundry closet with full-size washer and dryer is located in the hallway between bedrooms. Ceramic tile flooring runs throughout the entire home. Outdoor Living Space Private fenced yard with tropical landscape, lovely in-ground pool (with weekly pool service), covered dining/lounge area, outdoor lighting, dining tables and chairs, poolside lounge chairs, propane gas BBQ grill. There is also a separate "Tiki Bar Hut", which is great for outdoor entertaining. Covered front porch with bench and tropical plants. This home also has paved, off-street parking, and a covered entryway. Amenities Washer/dryer, high-speed WiFi, Cable TV in living room, DVD player, CD/stereo, CD alarm clock, kitchen/bed/bath linens & towels, ceiling fans, central AC/Heat, clothes hangers, dishes, silverware, pots/pans, cooking utensils, toaster, coffee maker, blender, microwave, dishwasher, full-size refrigerator, electric range, glassware, beach towels, blankets, coolers, beach chairs, rafts/floaties, two adult bicycles, kayaks, and more! Description: 2 Bedroom plus loft. 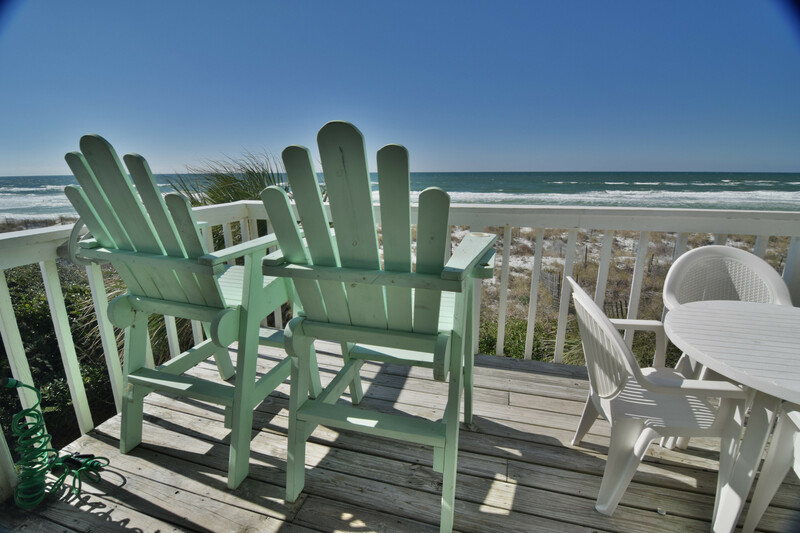 Beachfront Condo on Cape San Blas pet friendly beach. Great views and comfortable and clean inside. 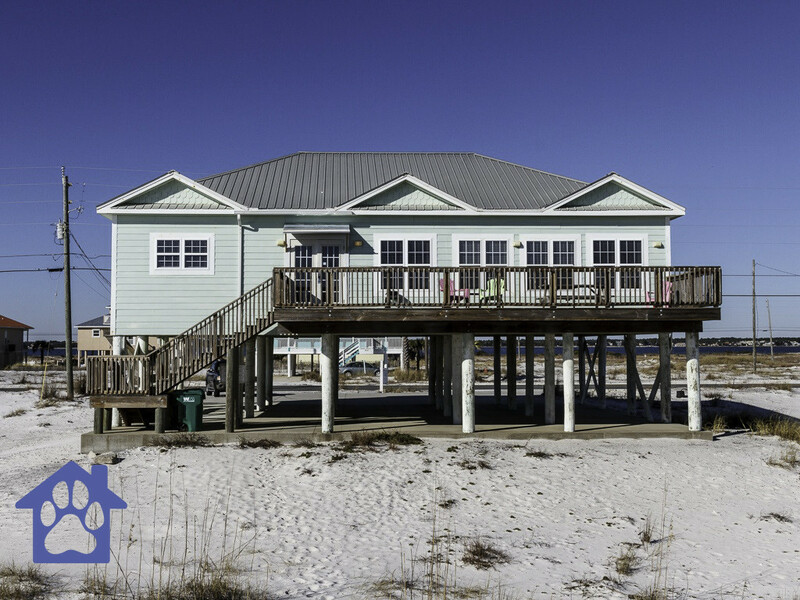 Make sure to check out this great place to stay when vacationing in Cape San Blas Florida. Pet-Friendly** Pet Gate on the back deck! Pet Policy: We only are "dog friendly", no cats. We have a $150 non-refundable fee in order to bring a dog. Description: Biglow's Bungalow is a family and pet friendly (small dogs) home located along Scenic Hwy 98 in the Gulfside Cottage subdivision. 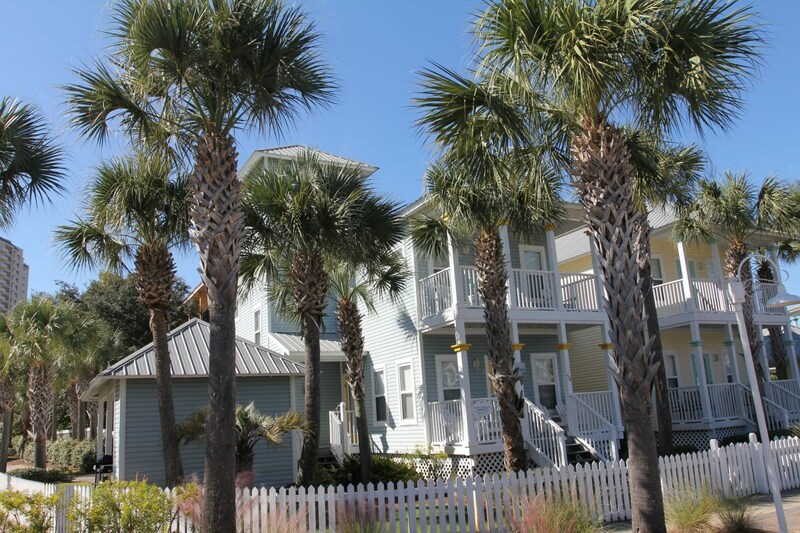 Gulfside Cottages are near the Silver Sands Outlet Mall in Miramar Beach. First Floor: Kitchen, living, dining and Queen bedroom with full bathroom. Second Floor: Master bedroom with King and private bath. Queen bedroom and a room with 2 twin beds and shared bath. Third Floor: Loft with twin daybed and trundle. Amenities included with your stay include: - One complimentary round of golf at Regatta Bay per day. - One complimentary Deep Sea Fishing trip on the Destin Princess per day. - 4 free tickets and 2 free rounds of minature golf per day at The Track. - Unlimited movie and game rentals, one movie/game out at a time. *amenities not included on monthly rentals This home rents weekly from Saturday to Saturday (March-August). Small dogs are allowed (with additional $150 pet fee). Parking for 3 cars. This home rents weekly from Sat-Sat (March-August). Pet Policy: Dogs only Must be housebroken (puppy pads not permitted) Must be spayed or neutered Must be 1 year old minimum No history of aggression Up to date on all shots/vaccines, and a flea/tick treatment within 14 days of arrival. Pet fee applies 200.00 for the full stay. Pet addendum signed at time of booking. Description: This beautiful 4-bedroom beach house is located on the beachside of Thomas Drive, in a quiet, relaxing location. 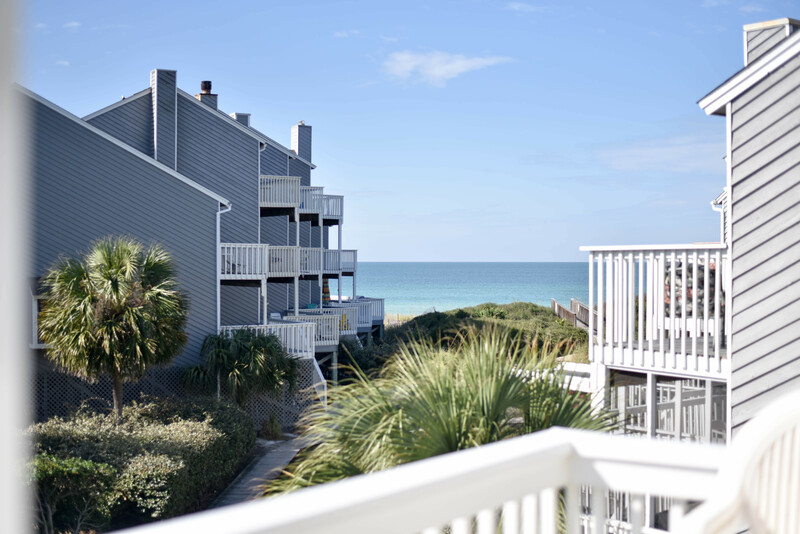 The beach is within a short walking distance for easy access. 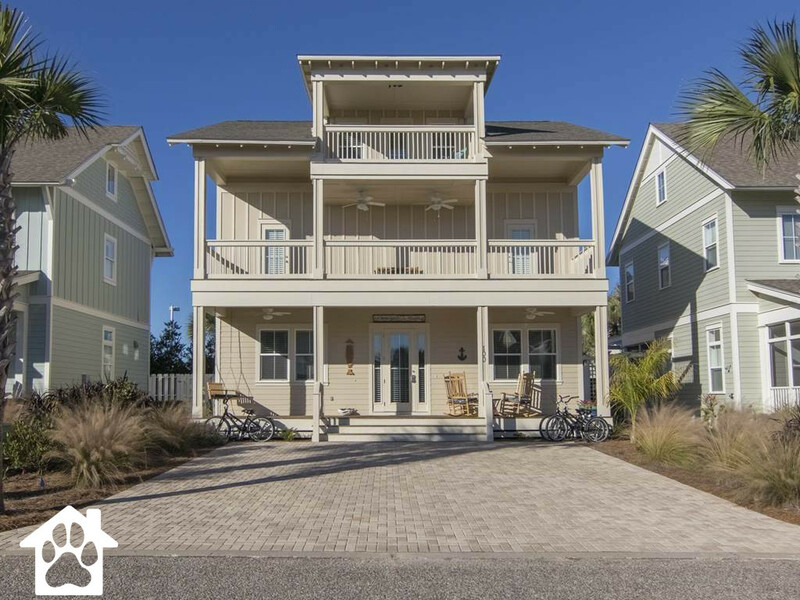 You can exit the house from the back gate to Holiday Drive, where you’ll find Beach Access 13. It is about a 1-2 minute walk from the house to the sand. The amenities add a special touch, making this beach house a luxury home. 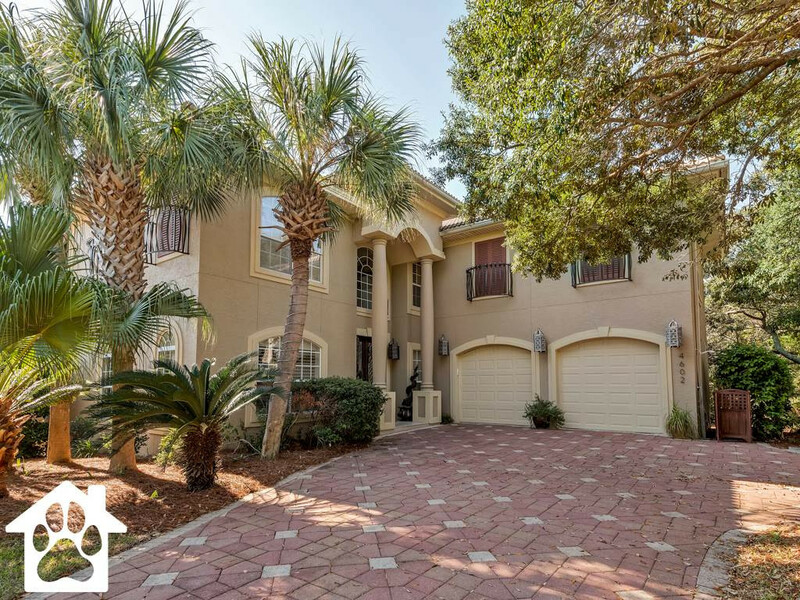 With a private, heated saltwater pool with a built-in sundeck; a fenced-in backyard; a hot tub with a waterfall into the pool; and French doors looking over the whole scene, it’s a picturesque vacation spot. 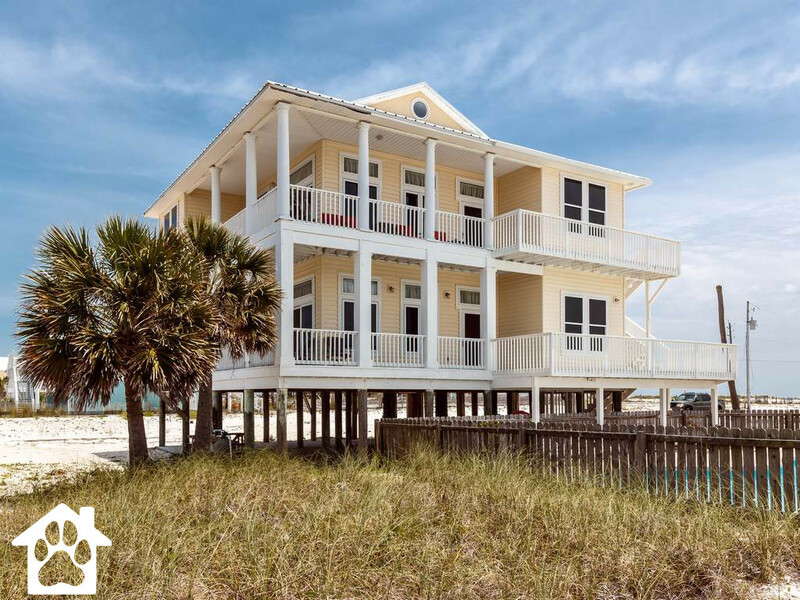 There is also a 1,400 square foot deck on the side of the house, decorated with tanning lounges, a gas grill, and a dining table with seating for 10 people. Other features for your stay include Wi-Fi, smart TVs, and keyless entry. The first-floor master bedroom has beautiful French doors overlooking the pool. There is a king-size bed in the master and a full bath adjacent to the suite. Upstairs, you’ll find three more bedrooms, one of which is an additional master with a private full-bath. The house has a total of 4 bedrooms and 3 bathrooms, sleeping a total of 10 people, with additional space for inflatable mattresses, if needed. There is a private parking lot adjacent to the house for your convenience. Please note: Renters must be above 25 years of age. Smoking only permitted outside. Description: Open and airy beachfront villa newly renovated in a crisp, clean and elegant coastal chic aesthetic maximizes views of emerald waters. 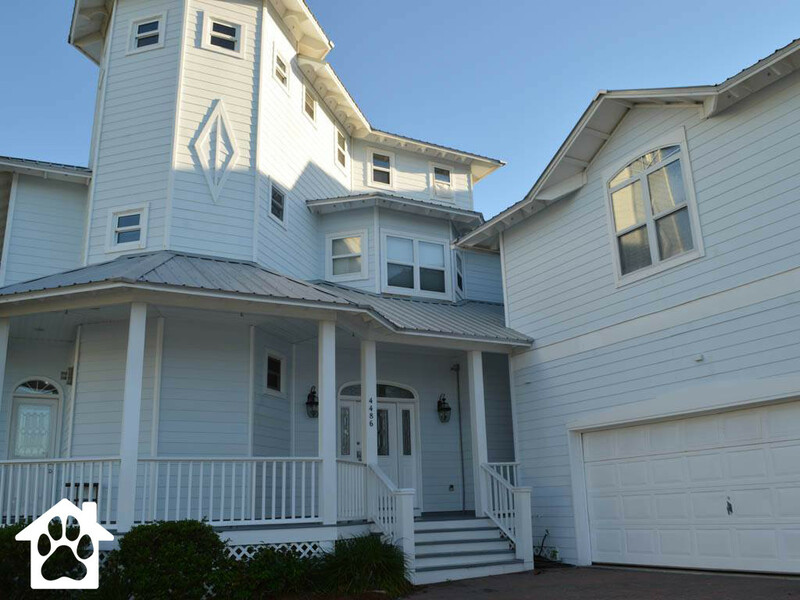 A private beach walkover leads to 100ft of deeded beach. 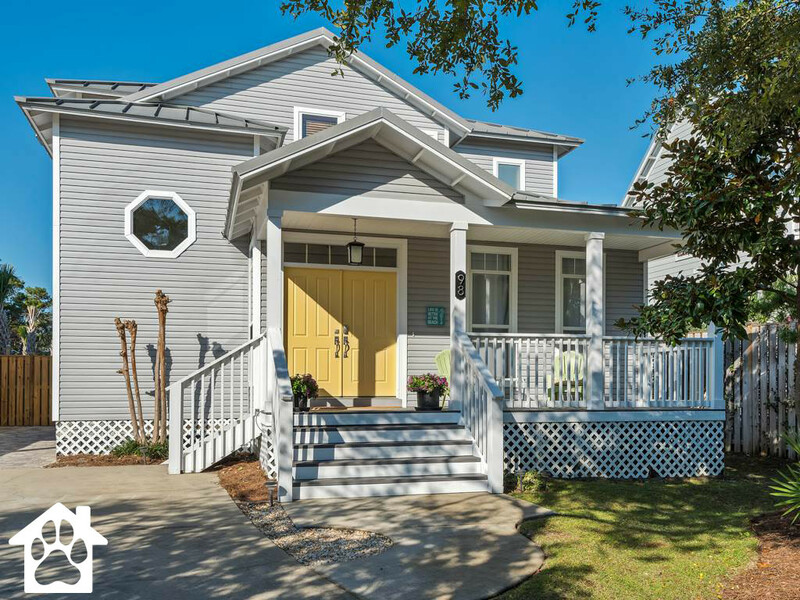 With distinctive design elements like, vinyl plank flooring, a barrel-tile roof, and semicircular driveway, this home is exceptionally designed. Sparkling waters greet you upon entering the home, and water views flow effortlessly throughout the interior. 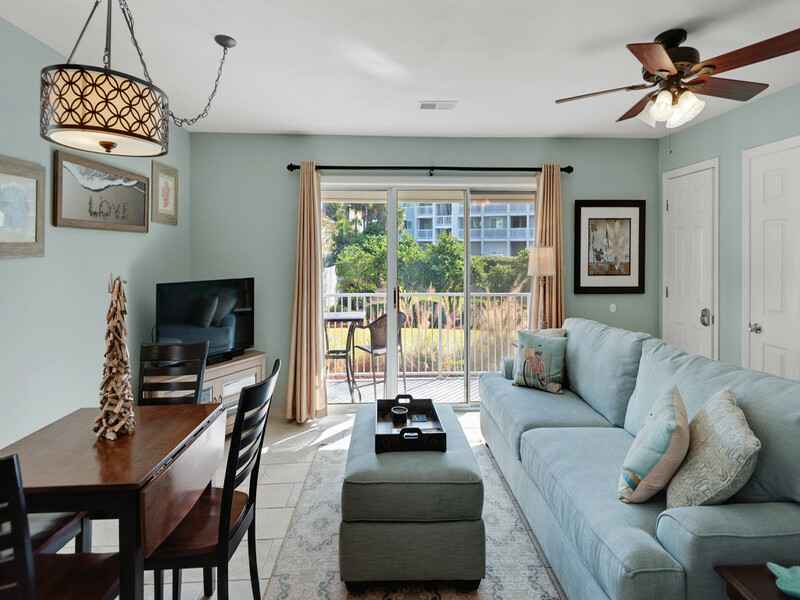 On the ground floor, the wide expanse of windows in the open kitchen/dining/living area welcome panoramas of emerald waters, while the open concept floor plan mimics the breezy feel of the surrounding scene. Rarely does a Gulf front home on Holiday Isle come available at such a reasonable price. 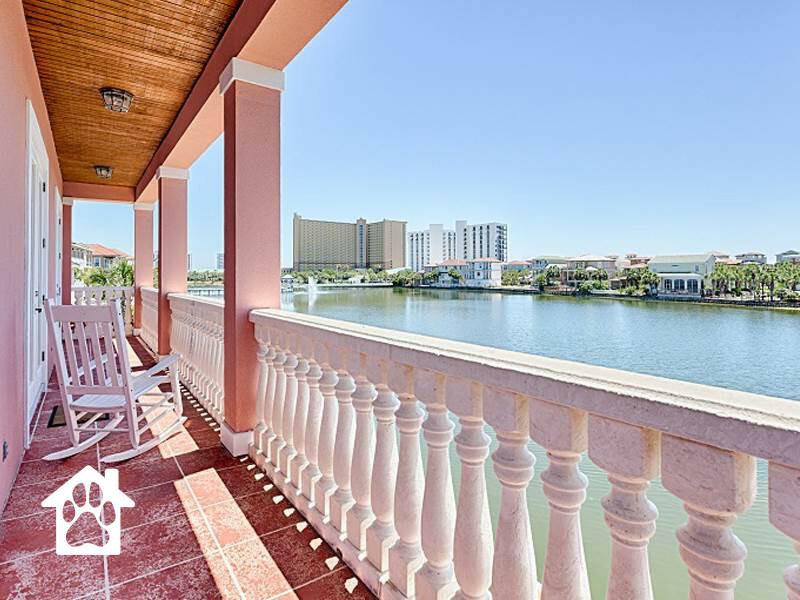 Do not missing this opportunity to secure this quintessential beach home which enjoys 100 feet of private beachfront that extends to where the emerald Gulf water meets the sugar white sand. This home has an established rental history. A deep covered porch on the first floor, joined by an equally deep sun deck on the second floor, are wonderful gathering places and spots to relax or sunbathe. Listen to the boats leaving East Pass and watch as seagulls and dolphins follow them. Beyond the open kitchen, living and dining room areas are windows and doors which stretch along the entire Gulf side of the home. Pet Policy: Dog-Friendly, Groups Welcome, Max Weight of Pet, Minimum Age to Rent, Non-Smoking Rentals, Pet Crate Required, Pet Deposit Required, Pet Fee: $125 Non-Refundable. Description: Enjoy a stay at this massive seven bedroom home. 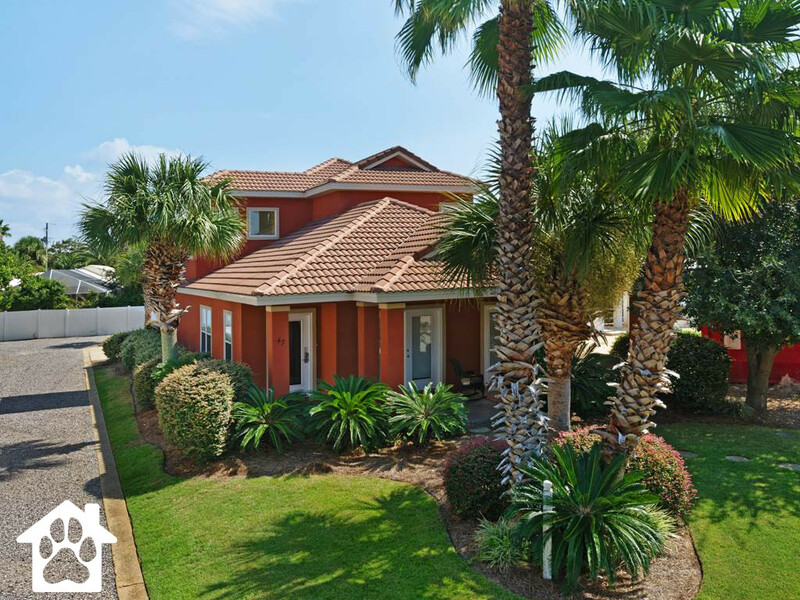 Located in Destin Florida, this vacation home is a short distance from the beach. This massive home can sleep up to 25 people, so it is the perfect vacation home for your family and friends. This elegant home is the perfect place to relax by the water. This pet friendly home will not disappoint. Pet Policy: Dog-Friendly, Pet Crate Required, Pet Deposit Required, Pet Fee: $125 Non-Refundable.